The day after Obama announced his executive immigration order, Reps. Michele Bachmann and Steve King traveled to Texas border town Roma. What they saw was shocking: a deserted border town ravaged by drug cartel crime. Ardent anti-amnesty conservative Rep. Steve King (R-Iowa) was specifically incensed by the fact that Obama's executive order allotted amnesty and work permits to parents of legal resident or U.S.-born children. King warned Americans not to fall for Obama's false narrative of compassion, which is viewed by conservatives as simply an attempt to document undocumented illegal immigrants to swell the ranks of Democrat voters. King even took it a step further in an interview with Breitbart saying that Obama's executive amnesty announcement means that "anchor babies will be an automatic human shield for the mothers and fathers of the anchor babies." When one views it from that perspective, Obama's amnesty order is anything but compassionate and perhaps even exploits immigrant children for political gain. "King laughed in disbelief that Obama actually claimed that criminals will be deported in the same speech in which he essentially ordered federal immigration agents to break the law by not deporting criminals who entered the country illegally and those who overstayed their visas. King said "it will take us weeks to unravel" Obama's "blatant collage of lies," including the claim that illegal immigrants who are given executive amnesty will not get any public benefits. "It's pretty clear that the president does whatever he thinks he can get away with," he said, noting that Obama does not think he is restrained by his oath of office or the Constitution." But King ensures that Congress has the power and obligation to stop Obama's unconstitutional act. 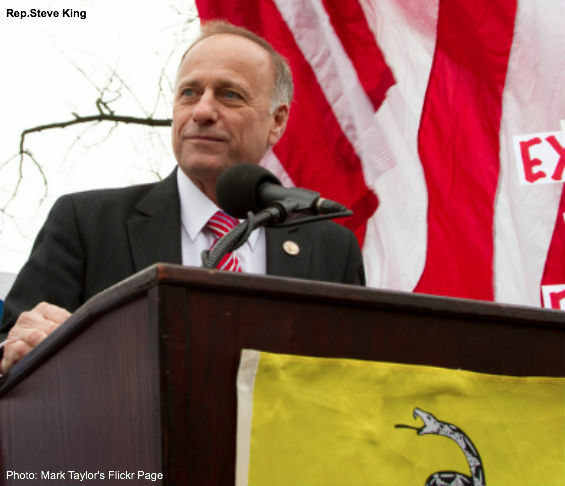 King stated that Congress should censure Obama and at least "constrain this president on the spending side" by using Congress's power of the purse to prohibit federal funds from funding Obama's executive amnesty. He also lauded Sen. Ted Cruz's offer that Congress should block all of Obama's appointments as long as the executive amnesty is active. King pointed out that Americans have been "commanded by history to defend the constitution," and must reject the order. Further, impeachment should be considered as a last resort. Submitted by IL_Citizen on Thu, 11/27/2014 - 00:02. De Facto Amnesty is end result. Many benefits for both political parties. Must have a dog and pony show for the public. Some benefits include unknown criminals to further drug trade crimes. This is massive amounts of unaccounted for tax free money. Voters. No Id for voting ring a bell? Dilutes American culture and values. Causes another division among the people. Side tracks public attention away from other issues. Entering these people into government and military is a form of invasion and takeover. Many other examples.